Peter Jones, with his wife Ann took over the Menai Stud on the death of Peter�s father, the late Willie Jones. 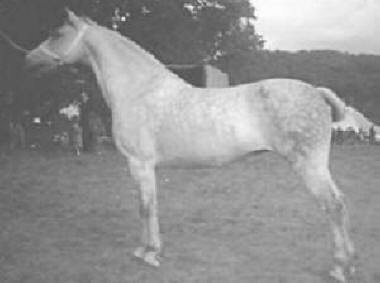 The Stud was founded by Peter's great grandfather John Jones, and his grandfather the late William Jones at the turn of the century, with registrations in the first few volumes of the Welsh Pony and Cob Society Stud Books. 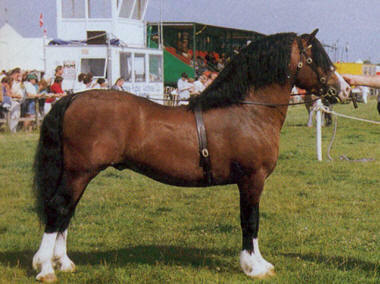 In fact most of the C�s and D�s presently in the stud go back on both sides of their pedigree to a mating in 1913, when the legendary Welsh Mountain Pony stallion Bleddfa Shooting Star was used on Clettwr Polly to produce Menai Queen Bess, who when covered by the small Cob stallion Welsh Rebound, produced the grey Section C mare Menai Queen Bee. Queen Bee proved to be one of the most influential mares in the history of the Section C�s and the Section D�s. Her influence would have been even greater had she been bred from at an earlier age. She was, for most of her life, indispensable as a means of transport for Peter Jones�s grandfather who often took Peter with him in the saddle, even before he could walk. It was not until 1955 that she had her first foal at the age of 18. 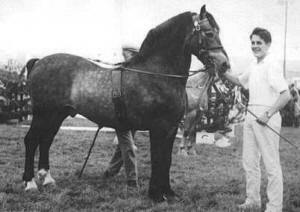 C stallions Llanarth Cerdin, and the outstanding Menai Fury (by Gredington Oswallt), foaled in 1963�. Peter Jones describes Fury as �probably the best I have had the privilege of showing�. 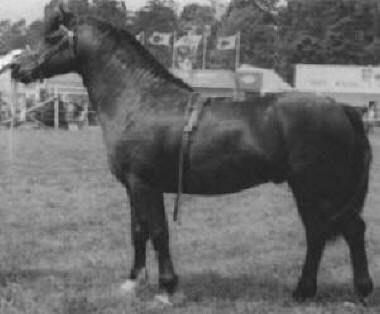 He was a sensational mover, and although he only won the Royal Welsh stallion class once, he was placed second on five occasions. It is as a sire that he made an indelible impression on the Welsh Section C�s. � I don�t think there has been another stallion before, or since Fury that has had such an influence on the Section C�s in general�, said Mr. Jones. �He was very fortunate in that people like Cerdin Jones of the Synod Stud saw the virtue of using him, and his blood runs pretty thick in the veins of all the Synod Section C�s.�. 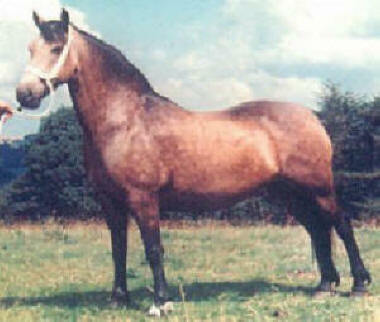 Fury left a legacy at Menai through some of his outstanding daughters like Menai Cadwena, the dam of Calon Lan, but mainly through his two sons the full brothers out of Meiarth Blodwen, Menai Furious and Menai Bonheddwr. 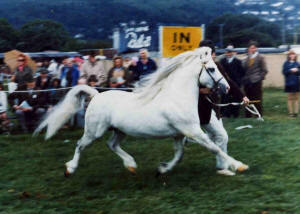 Raynier (by Menai Fury) out of Menai Carmen (by Synod Roger). 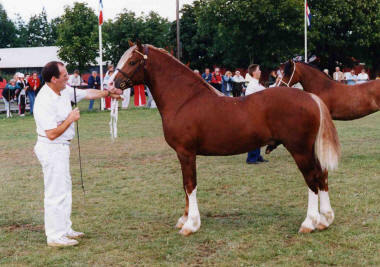 Cadfridog was sold to Tom Hughes (Alun�s father) from Anglesey as a foal, with whom he excelled in the show ring and as a stock getter before he was bought back as a 9 yr old. 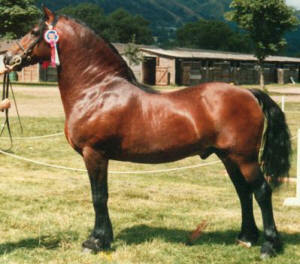 He has left some outstanding stock including the aforementioned dun stallion Calon Lan with whom he shares stud duties. Calon Lan was lightly shown as a three year old in 2007 and was both Youngstock and overall Champion Section C at Glanusk Stallion Show, 1st and Reserve Champion at Aberystwyth, 1st and Reserve Youngstock Champion at Northleach and 2nd at the Royal Welsh. 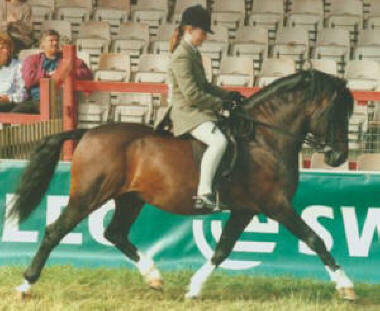 As a four year old he had some exciting wins under saddle and qualified for HOYS. His ridden career was put on hold as he proved with his first crop of foals to be an exceptional stock getter. 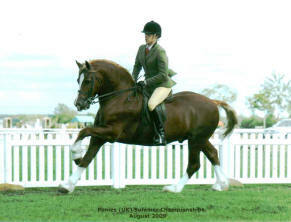 His daughter Lady Callie winning the three year old class and reserve Champion at Lampeter in 2010 before being sold to Germany. Another of his offspring the multple Champion Menai Curiosa who won her class, the Young stock Championship and was Reserve female and was Reserve Overall Champion at the 2013 Royal Welsh. Royal Welsh Female Champion Elonwy Shooting Star. 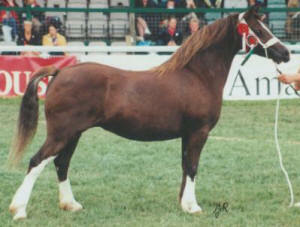 Another un-shown son of Cosmos that�s certainly proving himself as a top stock getter is Super Star out of a daughter of twice Lampeter Stallion Show Champion Menai Sparkling Comet, whose death at an early age was a great loss to the breed. He was the sire of such wonderful mares as the Royal Welsh Supreme Champion Gwenllan Sali and the previously mentioned dun mare, Elonwy Shooting Star, who was Royal Welsh Female Champion in 2000 and also dam of the Prater family�s illustrious winner Menai Golden Star. His most famous son without doubt would be Sparkling Image, who remains to be the only stallion to have sired the winner of the Prince of Wales Cup as Supreme at the Royal Welsh, the Fronarth Stud�s Llamri Lausanne, and the Supreme ridden M & M at HOYS Menai Sparkling Imperial. Much of the credit for putting the Stud on such sound footing must go to the late Willie Jones the father of Peter Jones whose obvious passion for the Welsh Mountain Pony was unfailing, he was responsible for re-introducing the Section A's to the Stud with a few select mares some fifty years ago. At that time the Section B colt Menai Shooting Star was making a name for himself in the show ring with the Springbourne Stud. Some of the mares were put to Shooting Star on his return to Menai, but soon the Section A stallion Gredington Oswallt was leased, and it did not take long for there to be more Section A than B�s at Menai. On the death of Willie Jones in 1986 his daughter Janet Morgan took over the Section B�s and they have since been registered under the Cloigen Prefix, though one daughter of Shooting Star remained at Menai, laying a solid foundation to breed true to type Section B�s. The present Section B stallion is the celebrated stock getter that needs no introduction, Newtonhill Naughty Boy Charlie. in that country for many years. 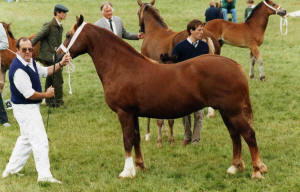 Twyford Marchog left some superb brood mares at Menai, before he was also exported to Australia. Despite having had two major reduction sales in 1996 and 2006 there are now no fewer than thirty Section A brood mares and six stallions at the Stud. Due to economic pressure from farming and having recently gone organic, it is likely that half of these lovely mares will be looking for new homes in 2012. 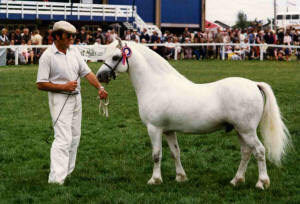 Some of the older mares in the stud are daughters of the very influential Champion of Champions Revel Japhet who retired from the show ring as Supreme Champion of all breeds at the 1986 Royal Welsh Show and qualifying for the Lloyds Bank Championship (now known as the Cuddy�s) at HOYS for the second time. Despite being blind for the last fourteen years of his life Willie Jones derived tremendous pleasure from Japhet�s wins and for years took the responsibility of feeding him three times a day. It was particularly sad that Willie Jones was in a coma during his final appearance at the Horse of the Year, and died a couple of days later. Japhet�s influence through his outstanding daughters will not go unrecognized neither will the contribution of the home bred Menai Smartie who still has three daughters in the stud. untimely death, but fortunately his outstanding son out of a Friars Ranger daughter, Menai Meteor is proving to be an exceptional stock getter. 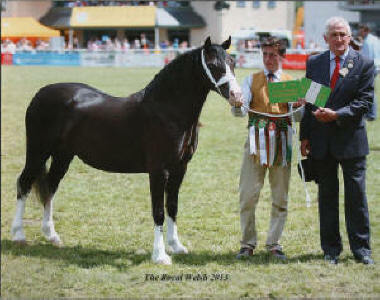 Meteor was shown very successfully as a yearling being Reserve young stock Champion at the Welsh Pony and Cob Society�s Centenary Show, and second at the Royal Welsh. He has been on lease at the Bryndefaid Stud for 2011 and no doubt he will leave his mark there. Another stallion to have proved his worth at Menai, prior to being sold to Germany, was Bengad Whitebeam and he leaves some lovely mares at Menai. Peter and Ann are particularly proud of Richard and Thomas�s achievements in ridden classes on our home bred ponies. Menai Silver Sian having given them both a fantastic start in lead rein classes, Richard had a lot of success with Menai Llew Aur and Friarly Flyaway (both now sadly outgrown) including the Mini Championship at the Royal Welsh in 2007, whilst Thomas won numerous Championships on Menai Mary Jane the lovely daughter of Betws Llew who was taken off the hill to pursue a ridden career, despite the fact that she was an extremely valuable brood mare, and her daughter Mary Alice was Champion Section A at the Toronto Royal Winter Fair. 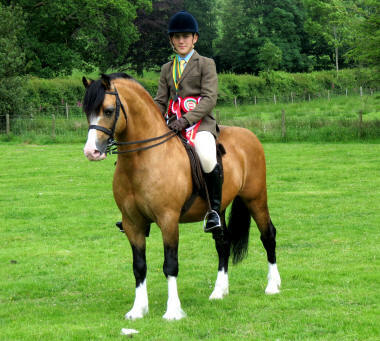 In 2013 Thomas has very succesfuly presented the Section C stallion Menai Calon Lan, and Richard the Cob Stallion Menai Cardi Llwyd under saddle, whilst Menai Martino ridden by Gemma Paxford won the Royal Welsh ridden championship for the second tim. Some thirty years ago in order to further the interest in Welsh Ponies and Cobs on the Continent, and to enable overseas clients to purchase animals in Wales with confidence, Peter Jones started a new business of providing an Export Service for overseas clients called P.J. Exports. From modest beginnings P.J. 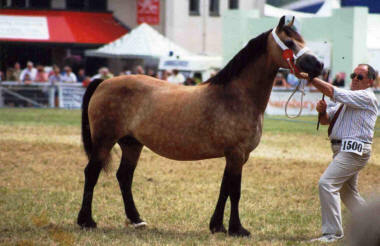 Exports has exported hundreds of Welsh Ponies and Cobs and other native breeds all over the world. 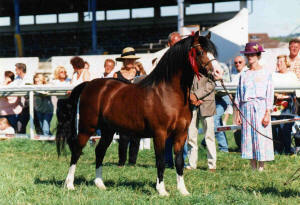 November 14th 1994 saw the biggest shipment of Welsh Ponies and Cobs to have crossed the Atlantic for 35 years, and the biggest shipment ever by air when no fewer than 32 Ponies and Cobs from all Sections arrived safely at Toronto for distribution through North America, of these 15 were Menai bred. Since then P.J.Exports have been responsible for the safe shipment of over 500 horses and ponies of all breeds including bloodstock by air to Canada and North America. P.J.Exports continues to provide an export Service to North America and after a gap of a few years, 2012 saw a consignement safely delivered via Toronto of with another shipment scheduled for November 2013. 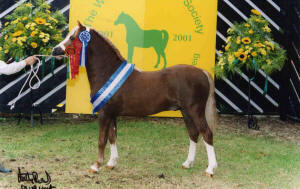 Menai ponies and cobs continue to enjoy tremendous success in the show ring, and their bloodlines are sought after both in this country and all over the world. Peter and Ann find it very gratifying that both their sons, Richard and Thomas, have inherited such a keen interest in the ponies and cobs. They have also derived a lot of satisfaction from seeing their home bred cobs and ponies enjoying so much success both in hand and under saddle. No doubt that with such enthusiasm the future of both the Menai and Friarly Studs is secure.